What is forsythia? What is it used for? Also known as the "golden bell" because of the shape and color of its flowers, the forsythia is a hardy type of tree that grows worldwide. 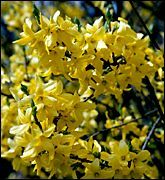 In China, forsythia is found in the Shanxi, Henan, Shaanxi and Gansu provinces. The fruit of the forsythia is used medicinally. Green forsythia fruit is preferred over yellow forsythia fruit. The fruit is steamed, dried in the sun, and the seeds removed from the fruit before used in herbal remedies. In traditional Chinese medicine, forsythia is considered to be bitter and cold, and is associated with the Heart, Lung and Gall Bladder meridians. It clears heat and expels wind. Forsythia is typically used to detoxify the body, and to treat fevers, headaches and excessive thirst. How much forsythia should I take? The typical dosage of forsythia is between 6 and 15 grams of dried fruit, powdered and added to boiling water for a decoction. Some practitioners recommend a slightly lower maximum daily dose of 10 grams. What forms of forsythia are available? Whole, dried forsythia fruit can be found at some Asian markets. In addition, powdered and capsule forsythia fruit is sometimes available at herbal shops and specialty stores. What can happen if I take too much forsythia? Are there any interactions I should be aware of? What precautions should I take? Forsythia should not be used by patients who have heat in the blood due to deficient yin, or diarrhea due to weakness of the spleen. In addition, the American Herbal Products Association has given forsythia a class 2B rating, meaning that it should not be taken during pregnancy. As of this writing, there are no known drug interactions with forsythia. As always, make sure to consult with a licensed health care provider before taking forsythia or any other herbal remedy or dietary supplement. Guo M, et al. Journal of Traditional Chinese Medicinal Material 1999;22(10):497-498. Long SJ, et al. Journal of Chinese Materia Medica 1999;30(1):40-43. McGuffin M, Hobbs C, Upton R (eds.) American Herbal Products Association�s Botanical Safety Handbook. Boca Raton, FL: CRC Press, 1997, p. 50. Zhou J, et al. Journal of Chinese Materia Medica 1999;30(9):661-663.